I'm the early riser in the family, though my son gets up pretty early as well. In something of a ritual, I'm usually up first on the weekends and begin to potter away in the kitchen, gathering ingredients, prepping breakfast. I look forward to this all week. For my half recipe (making about 8 generous pancakes), I used about half a cup of mashed sweet potatoes. Other key ingredients are plain yogurt, some milk, a couple tablespoons of melted butter, an egg, and the usual dry ingredients. So for fluffy, lofty, pancakes, separate the egg white from the yolk and stir it gently into the batter as the final step. That's what I did with this recipe. If you don't want to, you can leave the egg whole and go about the normal course of business. I went light on the warm spices - the ground cinnamon and nutmeg - but you can clearly taste it. We would have preferred a little more sweetness, flavor-wise, but texturally the pancakes were nice and light, soft and fluffy, with a delicate custardy center. Topped with maple syrup and some toasted walnuts, this was last Saturday's breakfast. I'm sure there will be other pancake renditions to come...it's amazing how many twists and turns basic recipes can take, and you never know when you might find a new favorite. The search is always on! * For extra fluffy pancakes, separate the egg and stir in the egg white as the last step in mixing the batter. If you prefer not to do this, simply add the entire egg (instead of just the yolk) in the first step. In a bowl, whisk together the mashed sweet potato, milk, yogurt, egg yolk, and melted butter until smooth. In a separate large bowl, whisk together the flour, sugar (if using), baking powder, baking soda, cinnamon, nutmeg, and salt. Add the wet ingredients to the dry, whisking together until just combined. Gently stir in the reserved egg white until incorporated. Let batter rest for 10 minutes. Heat a griddle or non-stick pan over medium heat. Lightly grease with butter or cooking spray. Add about 1/3 cup pancake batter for each pancake and cook for 2-3 minutes, until bubbles begin to surface. Flip the pancakes and cook for another 1-2 minutes, until golden and cooked through. Serve warm with maple syrup and a sprinkle of toasted chopped walnuts. Wow what a great recipe! I could eat a stack of these right now :) Love sweet potatoes but never thought to put them in pancakes. The color is gorgeous. Glad you had a nice long weekend! Happy summer Monica! It's amazing all the things we can put sweet potatoes in! : ) Hope you are getting plenty of rest following your trip! So soft and fluffy..and I love the lovely orangey colour from sweet potato. Yum! I actually prefer sweet potatoes in sweeter recipes (vs savory) and sweet potato pancakes are right up my alley. Before this, I made sweet potato chocolate chunk muffins that were so good and would be right up your alley. : ) Happy wedding - prepping!! Yes, poke bowls are rather easy once you get your hands on the good tuna/salmon, etc. I made a simple one and it was mighty tasty. 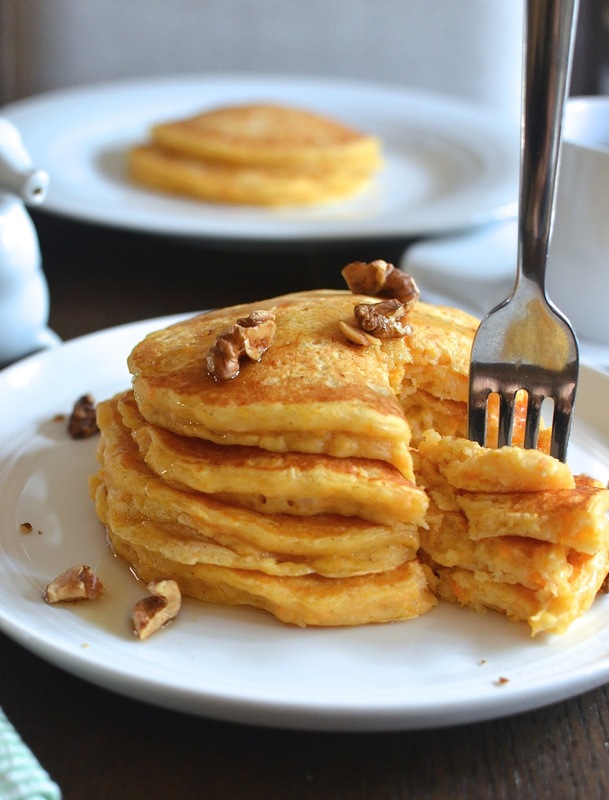 You know I love sweet potato anything so I definitely think I would enjoy these pancakes!! And I so agree with you on three day weekends - that one extra day makes all the difference! Thanks, Kelly! These are definitely on the healthy side and nice and soft. Try that spoonful of sugar for a little extra sweetness if you think your family will want that... Have a wonderful weekend! I am definitely going to make this next time I have some sweet potatoes. Music to my ears. It's nice to give each other ideas on twists to try. Have a great weekend. Long weekends are wonderful, Monica. And these sweet potato pancakes look so delicious and healthy too. I love using sweet potatoes, so I should give them a try. Lovey share. Have a wonderful weekend, Monica. Thank you, Anu. Hope you are enjoying a relaxing weekend with your family. Seriously,these look so good and fluffy. I've never used sweet potatoes in pancakes or for baking, need to do it, I'm sure it's amazing. And yayy to long weekends. Your sweet potato pancakes look so light and fluffy. What a super way to keep them moist and add a pop of color and healthiness into a pancake with the addition of sweet potatoes. Brilliant! A nice alternative pancake option for sure...thank you! 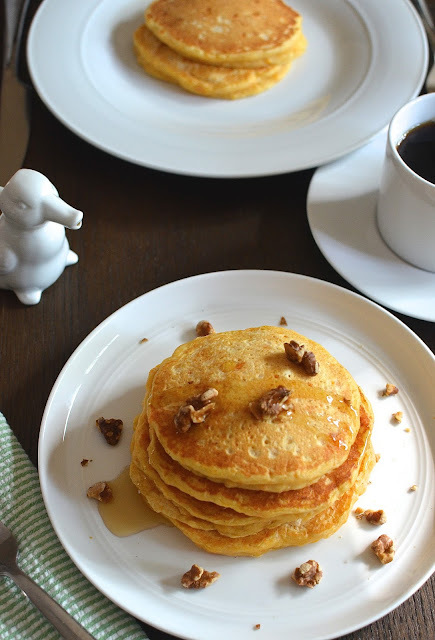 What a fun idea ~ pumpkin pancakes are y favorite, so this would be a great year round alternative, they look so fluffy! I bet they taste so sweet and delicious! And they look so fluffy and indulgent! The sweetness will depend upon the sweet potatoes. The yogurt offset the sweetness, too, so I would have liked to add a spoonful of sugar into the batter. That said, generous maple syrup fixes that issue. Wow, such a yummy recipe!! Sweet potatoes are one of the most delicious things in desserts! You are making me so hungry - here it is 5pm teatime - I would love to eat your pancakes with a cup of black tea. Sweet potatoes are one of my favorite foods. : ) Hope you enjoyed the bank holiday! Now THIS is something I have to try!! No worries at all!! I wish you all much success on your expanded business...sounds exciting and time-consuming. Life is busy all round. Thanks for stopping by and commenting when you have time.